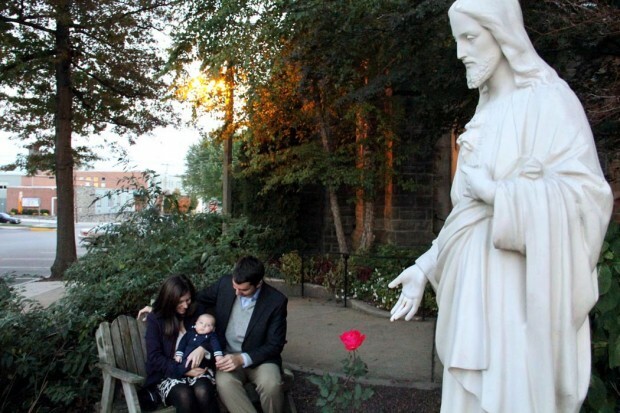 Scott and Abby Hollingsworth sit with their baby, Henry, in a prayer garden at St. Matthew Church, Conshohocken. Generally speaking, the marriage ceremony is very public but the formal engagement is private. In January 2010, when Scott Hollingsworth realized his relationship with Abby Kupstas had reached the point where they should become formally engaged, he chose a venue that tells a great deal about both of them. At the time they were both recent graduates of Villanova University. She was born Catholic and he was an RCIA candidate at St. Matthew Parish, Conshohocken. Abby will never forget how it happened. It was supposed to be on Saturday morning, but when they arrived there was no one else there. “That’s funny, did I get the date wrong,” Scott mused. The door was unlocked and he suggested they go in and look around anyway. At the front of the church, he suggested Abby go up to the altar with him. She wasn’t so sure that was proper. “What if Father comes in and sees us?” she said. “Oh, it will be alright,” Scott assured. At the altar he started to talk about their relationship, which she thought was really nice. It wasn’t until he got down on one knee that she realized this was his proposal. They were married that December. To take it back to the beginning, Scott and Abby are both Marylanders; he from the Eastern Shore and she from Annapolis. Abby, secure in her faith, saw it blossom at Villanova where she majored in accounting with a minor in peace and justice and also became a Eucharistic minister. Scott was also an accounting major but his minor was theology. The truth of the matter is Scott, who was born Methodist, was spiritually searching well before he met Abby. As is often the case among Protestants, his family was not tied to a single denomination but worshipped at different churches. Interestingly enough, he did have a distant genetic tie to Catholicism; his mother was a Carroll descended from the Carrolls of Carrollton, the leading Catholic family of Maryland, which produced the only Catholic signer of the Declaration of Independence. Scott chose Villanova for his college years because it would be a good chance to explore Catholicism but not necessarily become a Catholic himself. During this period he also visited England to reconnect with the Methodism of John Wesley. Examination of those roots led him further back to the Anglican faith from which it sprung and its American branch, the Episcopal Church. He very seriously considered formally joining the Episcopal Church. But there was that growing interest in Catholicism. As a means of exploring the Catholic faith he asked if he could attend the RCIA meetings without becoming a member of the group, and did so. You might say he audited the course. Because he and Abby were both accounting majors in the same year, they knew each other as friends, but really weren’t dating until they were thrown together during an accounting internship. “We were both kind of frustrated with the atmosphere of the corporate world,” Abby said. 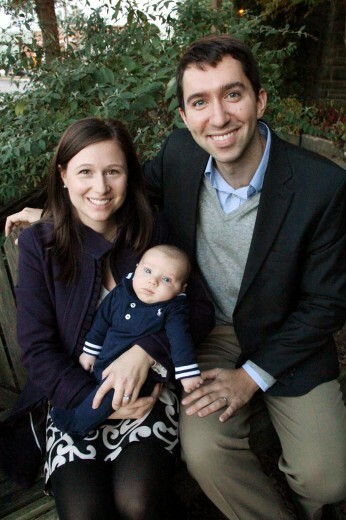 Abby’s interest in social justice and Scott’s interest in theology made them a natural pair. She did some work with Habitat for Humanity and traveled to El Salvador for a Faith in Action program conducted by the Handmaids of the Poor. Partially at her suggestion, Scott went on a mission trip to Mexico and Honduras, and he began attending Mass with her. When they graduated from Villanova in 2009, both remained in the Philadelphia area. Scott took a position with Johnson and Johnson while living in Conshohocken, and Abby worked for Price Waterhouse Coopers and lived in Manayunk. 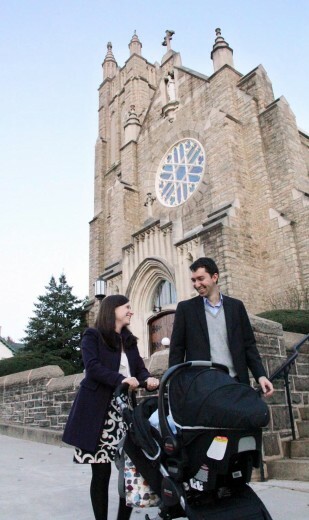 The Hollingsworths take a stroll on a beautiful day past their stately parish church, St. Matthew’s in Conshohocken. Scott did not become Catholic just because Abby was Catholic. It was only after a long period of searching that it was in the fall of 2009 he formally joined RCIA at St. Matthew, and was received into the Church at the 2010 Easter Vigil. As he studied Catholicism, Scott came to see the differences. Other differences are more subtle. In most Protestant congregations, fellowship is extremely important. Scott observes in Catholicism, it is more of a community aspect. Abby and Scott were wed Dec. 11, 2010, at Abby’s childhood parish, St. Mary in Annapolis, a parish which by coincidence has relevance to Scott’s family history. St. Mary Church was built on a former Carroll estate that was specifically donated to the Church for the purpose of the founding of a parish. After their marriage they settled in St. Matthew Parish, where Scott is now a lector. Although Scott and Abby are active members of a small inter-parish prayer group, and they have participated in outreach at their parish, right now Abby’s focus is in the home. Two months ago they were blessed with their first child, Henry. It’s a name they both like and it was also the name of Abby’s great-grandfather who lived to be 101, which wouldn’t be bad to pass on to their child. She has left the workforce to be a full-time mom. Whatever happens, the future for Scott and Abby will almost certainly revolve around the sense of faith and family ties they learned from their own nurturing families, despite differences of creed.